A new skincare cookbook series has been announced by Butterfly Ageless Beauty. Their website features a range of advice articles and products for skincare, healthy living and fashion for older women. 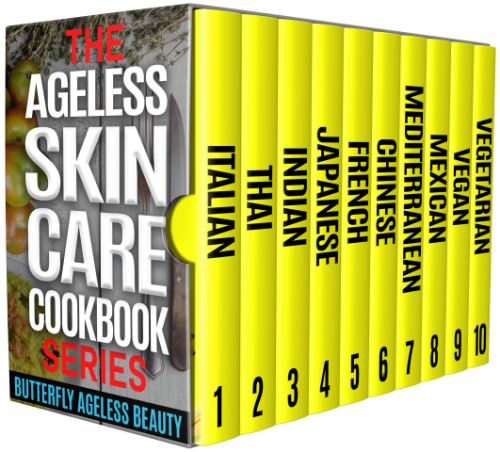 Butterfly Ageless Beauty have released a collection of skincare recipe cookbooks. The series of books features delicious and healthy recipients from around the globe. For more information, please visit the website here: https://blog.butterflyagelessbeauty.com. Butterfly Ageless Beauty is an online resource and retailer for mature, fashion conscious women from around the world. Their mission is to continue to carry the innovative products that their customers want at the prices they need. The company specializes in offering skincare, healthy living and beauty advice and products. One of their newest products is their series of recipe books, Ageless Skin Recipes. This series of books aims to aid a youthful complexion from the inside. The recipes in the series of 10 books have been selected due to their ingredient’s anti-ageing properties. By eating a nutrient rich and vibrant diet skin will be nourished and look more youthful without the need for invasive needles or Botox. They explain that eating a tasty meal and building ageless skin at the same time should be fun. Each of the 10 books in the series follows a different styles of cookery. The styles of cookery includes Italian, Thai, Indian, Japanese, French, Chinese, Mediterranean, Mexican, Vegan and Vegetarian. This means that there is always a recipe option no matter what the event is or what guests arrive. Those wishing to find out more about Butterfly Ageless Beauty and their Ageless Skincare Recipes series can visit the website on the link provided above. They can also find the series on Amazon where it is available to purchase.